Thirty-some odd years ago when he first began moving graphite on paper Justin Gibbens was rendering the boyhood standards: dinosaurs, creepy crawlers and other freakish fauna. Not much has changed in three+ decades. 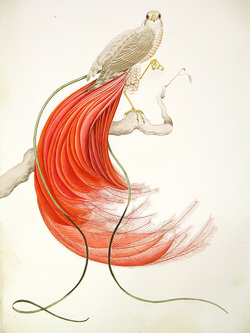 Trained in both scientific illustration and tradition Chinese painting, Gibbens uses this skill set in his subversive zoological drawings. Justin Gibbens received his BA in painting and drawing from Central Washington University in 1998 and a Scientific Illustration Certificate from University of Washington in 2003. He is a founding member of PUNCH Gallery, an artist-run gallery located in Seattle, WA. Gibbens was the recipient of a 2006 Pollock-Krasner Foundation Award and a 2008 Artist Trust Fellowship Award. He has shown nationally and internationally and lives in rural Thorp, Washington. He is represented by G. Gibson Gallery in Seattle, WA and Elizabeth Leach Gallery in Portland, OR. His work has been collected by Grinnell College, Microsoft, 4Culture/King County Portable Works Collection, City of Seattle (Seattle City Light: Portable Works Collection) and the Washington State Arts Consortium. In addition to his studio practice, Gibbens has begun adapting his images for larger-scale public mural projects.